A stay at Blue Bay Resort & Spa in Agia Pelagia is guaranteed to be as lively or as relaxing as you wish. 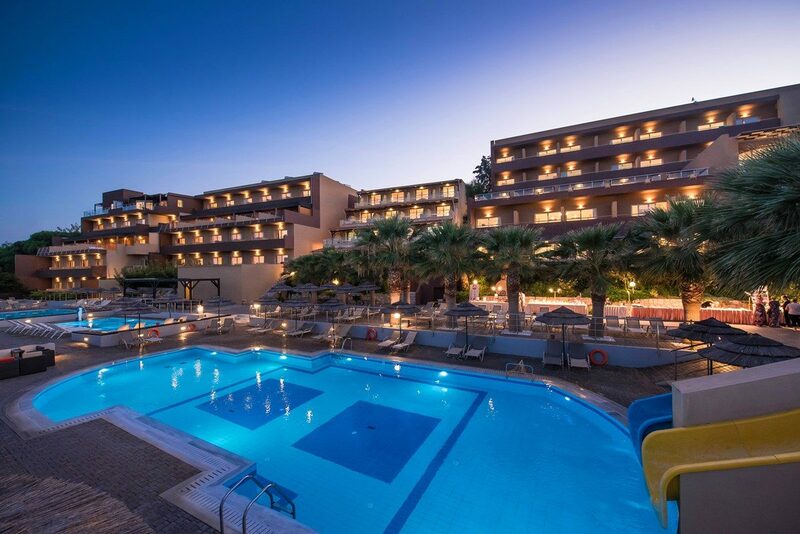 The hotel is ideal for families looking for an enjoyable stay in Crete. Days at Blue Bay Resort & Spa can be spent lounging by one of the six large swimming pools. Stay active and use the sports facilities; perhaps challenge your family to a tennis match or workout in the gym. If you want relaxation, the spa is the place to go. Use the sauna and steam room at your own leisure or indulge in a back massage or facial for a luxurious pamper. 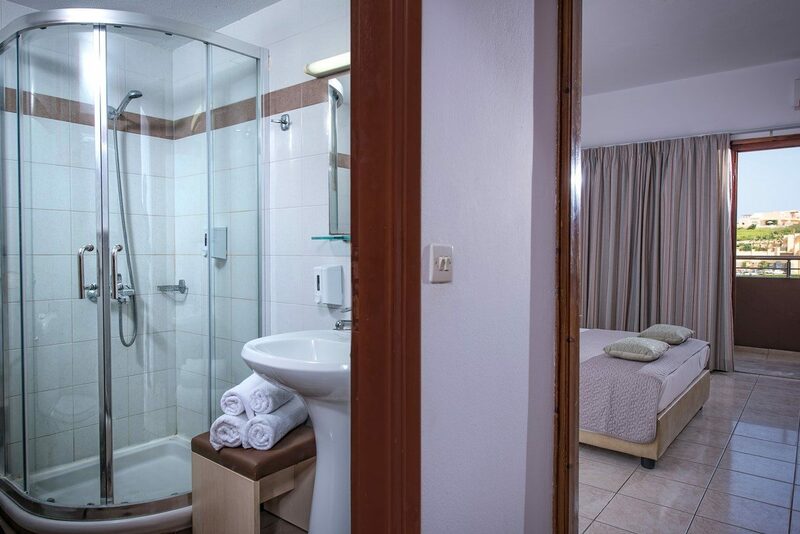 Back in your hotel room, enjoy a comfortable stay as you cool off under the air-conditioning. Take a refreshing drink from the minibar and gaze out at the spectacular views. There's a wide range of dining options at Blue Bay Resort & Spa. Taste Greek cuisine in the buffet or explore the variety of international options. If you fancy fine dining, take a seat in the Panorama restaurant and sample a la carte cuisine. Enjoy light options from the snack bar and don't miss the themed nights! 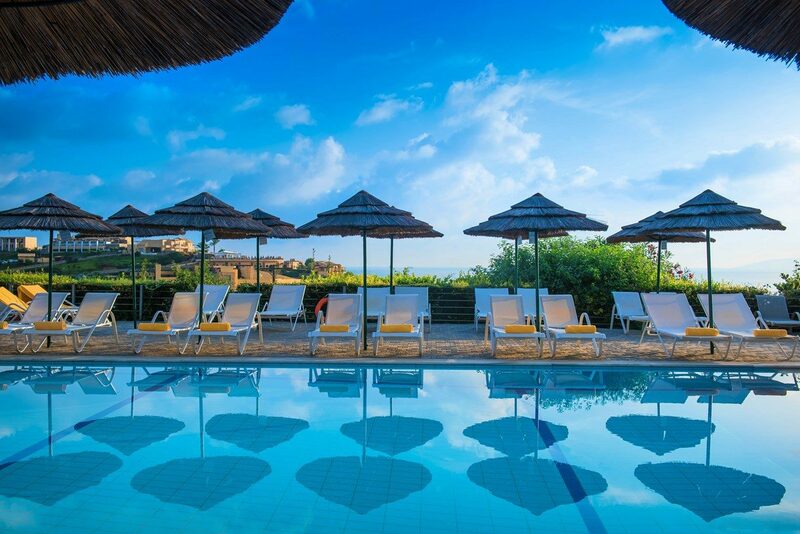 With so much on offer, it's easy to see why Blue Bay Resort & Spa is a top choice for family holidays in Crete. 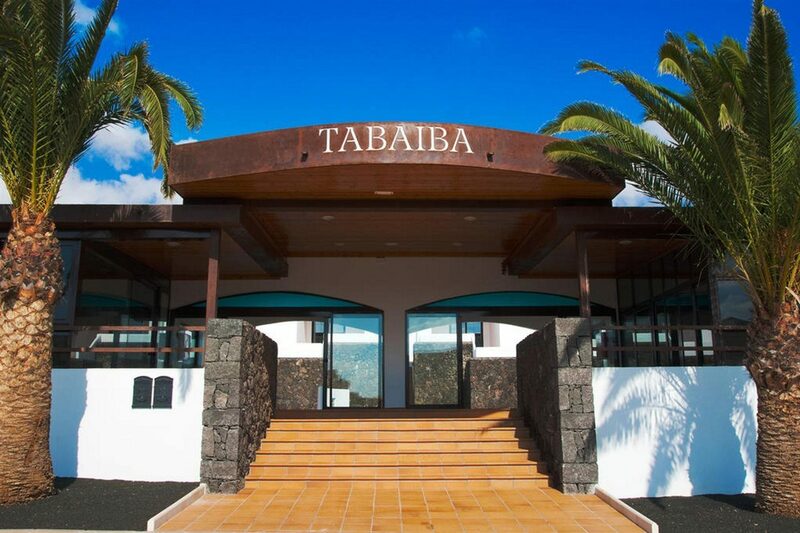 Facilities include two restaurants, three bars, six swimming pools, an open-air theatre, mini market, private parking, bus stop, 24-hour reception with currency exchange service, complimentary Wi-Fi in public areas, and luggage storage. The spa has a sauna, steam room and a variety of treatments available. 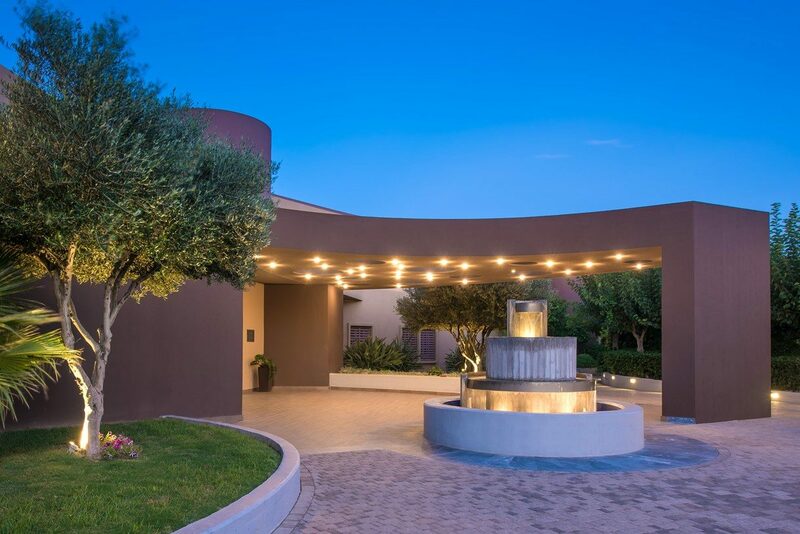 On-site activities include mini golf, table tennis, tennis, football, basketball, volleyball, and a gym. Blue Bay Resort & Spa has a total of 209 guest rooms spread across the main building and four complexes close by. 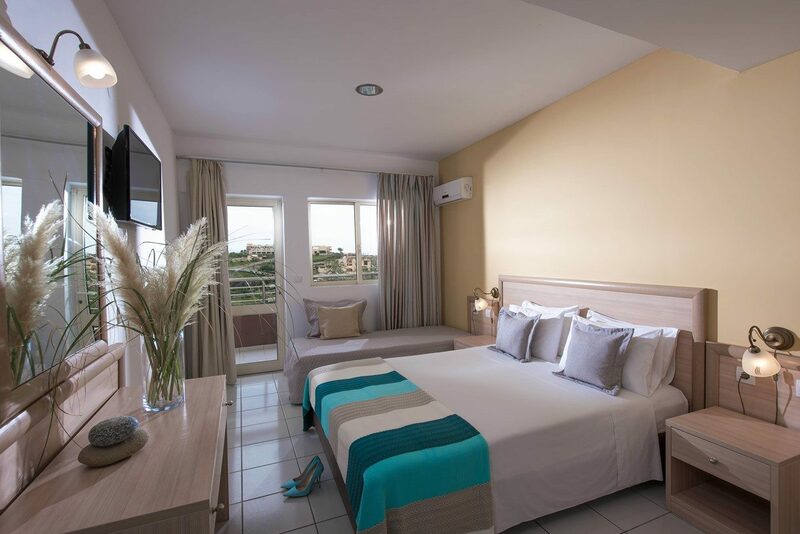 Each room has views of the sea, gardens or surrounding area and offers daily cleaning, room service, bathroom with shower or bathtub, air-conditioning, minibar, telephone, hairdryer, safe, and satellite TV. The main restaurant Amvrosia is a self-service buffet that serves breakfast, lunch and dinner. Local Greek and international dishes and a range of drinks are served here. 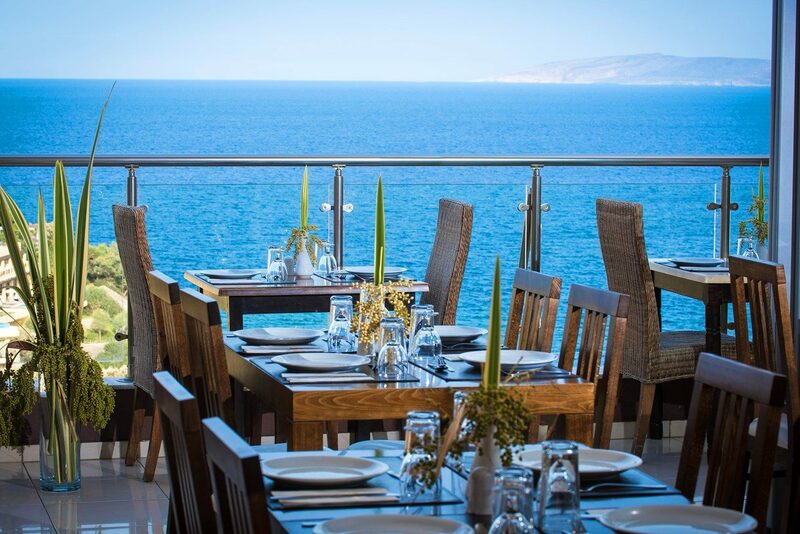 Panorama restaurant serves a la carte cuisine and has an extensive menu for you to enjoy. 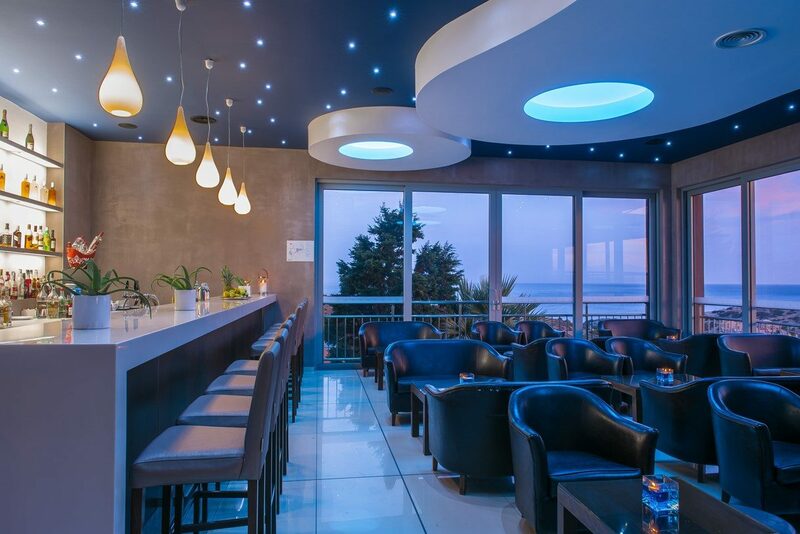 Light snacks are available from Breeze snack bar and a wide range of drinks served at Dyonissos bar and Pergola pool bar. There are themed nights including BBQ and lobster night in the hotel and live entertainment is provided at the open-air theatre.